> British Lime Trees, nectar producing now! Well the honey season is truly under way and its been a delightful surprise. The warm weather has been a big help and our honey boxes are filling up very quickly. The reports from other beekeepers throughout the country are the same. So this year should help to make up for the dreadful past three years. 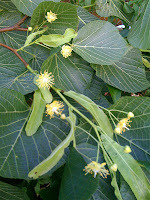 The Lime trees are in full blossom so we expect a good yield of lime (linden blossom) honey this year. We have extracted some beautiful spring/early summer honey that consists of blackberry, hawthorn, field bean & wildflowers. It is such a lovely scented, medium light honey. It was a fine catch!